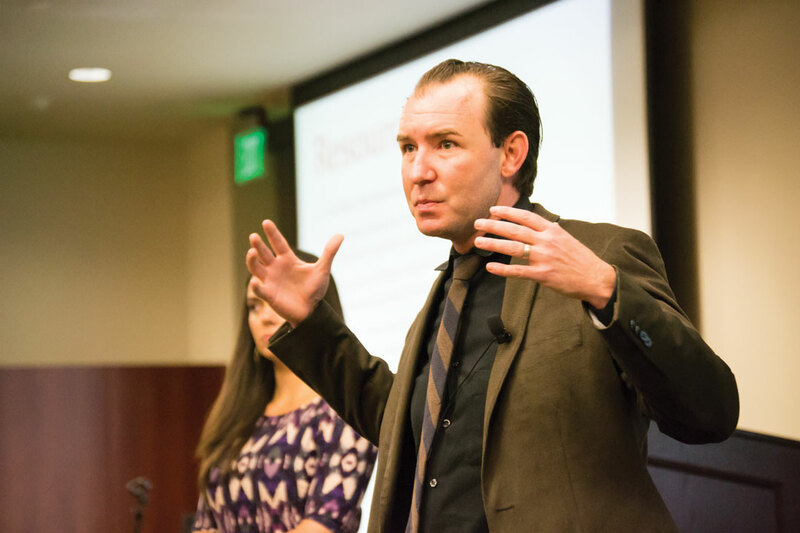 California Baptist University’s School of Behavioral Science hosted its annual Culture and Justice Lecture Series Feb. 16, in which Damien O’Farrell, CEO of Path of Life Ministries and CBU alumnus, spoke to students and professors in Innovators Auditorium. O’Farrell’s lecture, titled “Justice for All: Homelessness and Poverty in an Economy of Abundance,” addressed issues about how homelessness is perceived and suggested solutions to solve this issue locally and in other cities with the same homeless situation. While discussing the topic of helping the homeless, providing housing is a solution that seems simple, but is not. The resistance of the homeless to receive help and the limited amount of space and resources of a non-profit organization make it difficult to meet basic needs in the shelter the organization provides for the homeless. Dr. Jacqueline Gustafson, dean of the School of Behavioral Science and associate professor of psychology, said homelessness is a salient issue and it is important to expose students to this topic. O’Farrell issued a call to action by telling students to use accessible resources and connect with others to help with homelessness. Luke Meeter, senior anthropology major, said the event was insightful and he enjoyed hearing O’Farrell speak about how people can help the homeless.